The number of TV channels has been rising for years. As a result, consumers pay for not only the channels they want, such as ESPN and the Discovery channel, but also for dozens of lesser known networks—such as Esquire and MTV Classic—which have a fraction of the audience. Consumers are basically being forced into bundled packages despite whether they watch the channel or not. With the proliferation of online streaming, many have begun to wonder why they continue to pay for cable television channels they don’t watch. On average, viewers have access to over 200 channels and, according to Nielsen research, they watch fewer than 20. As consumers change with the times and technology evolves, alternative ways to access content through streaming services has become more prevalent. In terms of television, the “cord cutting” movement is the practice of using an alternative internet-based or wireless service in lieu of paying for a cable television subscription. According to the Pew Research Center, 1 in 7 Americans is a cord cutter and 61% of young adults primarily watch television through over-the-top streaming services. Many cord cutters cite the relative cheapness, access to content in the form of movies and original shows online, and the ability to choose what they pay for as reasons for making the switch. The ease of transitioning to streaming services and cord cutting is not going unrecognized as the practice is having a meaningful impact on the cable industry. Five of the biggest U.S. cable providers posted subscriber losses during the second quarter of 2017 as viewers gradually cut the cord. Comcast, lost 34,000 subscribers during the quarter, compared with 4,000 customers lost in the prior-year quarter. Although AT&T added 152,000 subscribers to its DirecTV Now streaming service, AT&T lost 351,000 subscribers which were not enough to offset total losses. The fragmentation in the market has been both a challenge and an opportunity for cable providers. 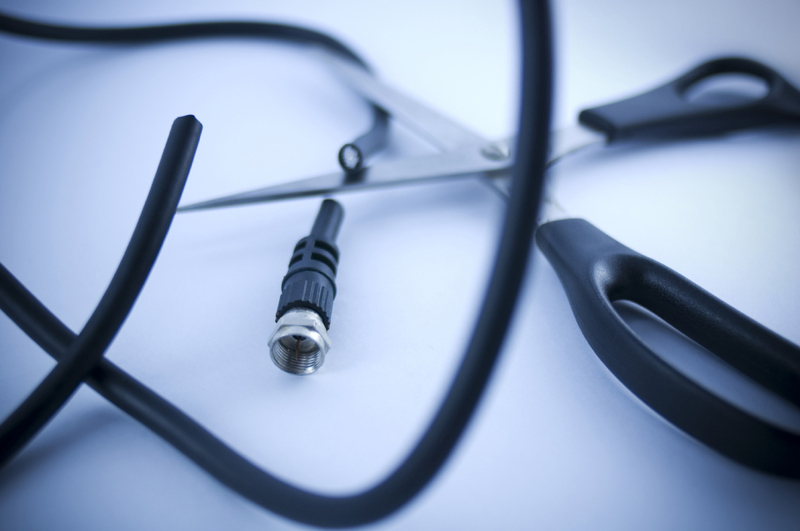 The challenges of cord cutting are spurring media consolidation talks. Midsize cable networks, particularly those without broadcast or sports networks, could struggle to adapt to new forms of distribution. To stem the bleeding and compete against streaming services like Netflix or Hulu, cable companies have started offering “skinny bundles,” or cheaper packages with select channels. The target demographic for these skinny bundles is younger viewers who have grown accustomed to greater choices and flexibility when purchasing goods and services. They are driving the decline in traditional cable subscriptions. According to a survey by Altman Vilandrie, nearly 70% of non-subscribing 18-24 year olds—more than any other age segment—agree that they would consider subscribing to pay TV if there were “more affordable channel lineups that fit their viewing taste.” This has many wondering whether “skinny bundles” will be enough as it is expected that 22 million people will cut the cord on cable, satellite or telco TV service in 2017, up from 16.7 million in 2016. The streaming service providers understand the wants and needs of their customers and have significantly increased their investment in original programming to remain competitive. 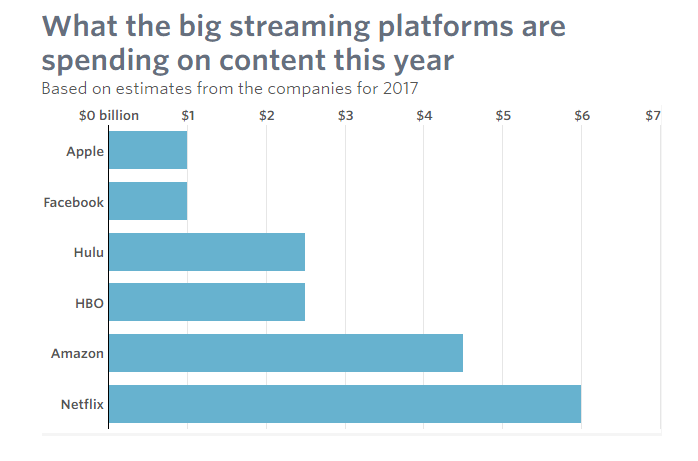 Providers like Apple has stated they will invest $1 billion in original content, Amazon is expected to spend 4.5 billion, Hulu will spend 2.5 billion and Netflix is expected to spend 6 billion, in addition to another 10 billion in obligations! Although leading with price may initially drive growth it is not sustainable. If streaming services are not able to retain subscribers and maintain a level of perceived value, consumers will constantly switch for the better deal and erode any loyalty. 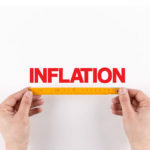 Streaming service providers need customers that stay on their platform to subsidize costs before additional fee increases hit an inflection point and the costs are on par with traditional cable providers, negating the reason to cut the cord. Technological innovation has finally delivered on the consumer’s desire to unbundle their cable packages. Streaming service providers are an existential threat as barriers to entry have come down. The cable industry is in the midst of a major transformation and will have to pivot as streaming services erode market share. The ability to consume content when you want, how you want, and where you want has transformed the industry landscape and only time will tell if actions from the large cable providers will be enough as the adoption of streaming services is on the rise with no sign of slowing down.